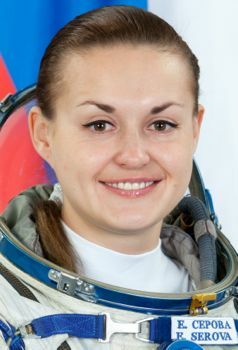 Russian engineer cosmonaut, 2006-2016. Wife of Mark Serov (2003 selection group) Graduate of MAI. Worked in TsUP Flight Control Center. Status: Inactive; Active 2006-2016. Born: 1976-04-22. Spaceflights: 1 . Total time in space: 167.24 days. Birth Place: Vozdvizhenka, Saratov. Family: Cosmonaut. Country: Russia. Flights: Soyuz TMA-14M. Agency: TsUP. Bibliography: 6010. Birth of Elena Olegovna Serova - . Nation: Russia. Related Persons: Serova. Russian engineer cosmonaut, 2006-2016. Wife of Mark Serov (2003 selection group) Graduate of MAI. Worked in TsUP Flight Control Center. 1 spaceflight, 167.2 days in space. Flew to orbit on Soyuz TMA-14M (2014)..